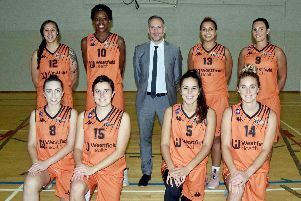 Westfield Health Sheffield Hatters have made a flying start to the Women’s British Basketball season with three successive wins including a weekend double. Hatters were without a trophy last season but are top of the early standings. Yesterday they had a convincing 84-62 home win over BA London Lions at All Saints, following Saturday’s 80-71 road win at Manchester Mystics. Veteran Steph Gandy was yesterday’s star with a game-high 21 points on 8-of-13 shooting having netted 12 in the first quarter. Krisztina Velkey scored 16. On Saturday Gianna Woods followed up her All-Star Five display from Week 1 with 21 points, Gandy scored 17 and Helen Naylor 15.